STORY BY KATHERINE HUNTER, FNN REPORTER, TECH PREP BUREAU. PHOTO BY KATRINA SMITH. APRIL 29, 2014. Ronnie Easley, 9th grade: Vincent Mclean , 9th grade; Josiah Brown , 10th grade; Devonte Wood, 10th grade; Jasmine Jones, 10th grade; Brandon Pryor, 10th grade; Alexis Fleming, 10th grade; Shampale Jones, 11th grade; Rydia Wright , 11th grade; Luchee Jones, 11th grade; Jazmine Kibler, 11th grade. These students were on time, behaved in class and/or did exemplary work. Anyone can become Student of the Month if they follow these requirements. 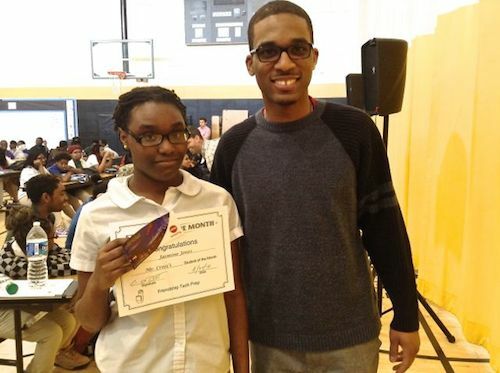 - Katherine Hunter is a freshman at Friendship Tech Prep Academy. Are We Really Post Racial?